I have never been able to quite figure out what makes a volume on a Soviet or Russian type fall under the Aerofax imprint as opposed to the Red Star Series, a stable mate at Ian Allen Publishing. 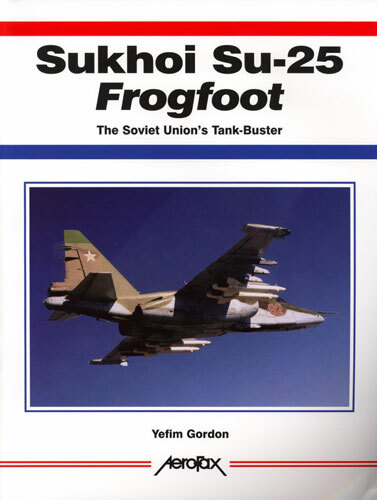 In this case the decision appears to have been made that Yefim Gordon's volume on the Sukhoi Su-25 Frogfoot would come out under the former imprint. Regardless, what is presented would be familiar to readers of either series and particularly of Gordon's previous works. Dating from an operational concept first mooted in 1969, the Su-25 (or T-8) Frogfoot was intended to be the new "Shturmovik" for Soviet Frontal Aviation, drawing on the lessons of the skirmishes of the 1950s and 1960s in much the same way as the US would to ultimately produce the A-10 Thunderbolt II. 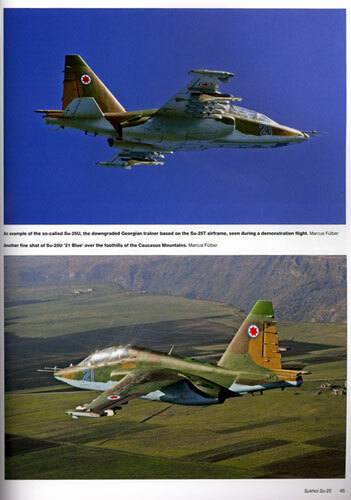 Much has been made as to the similarity between the Su-25 and the losing contender for US A-X competition, the Northrop YA-9, although in this volume Gordon contends the design work on the Su-25 began as many as four years before the YA-9 emerged. Regardless the Su-25 also drew on the mystique of the Shturmovik, which first emerged in WWII, as a robust close air support and ground attack aircraft. Anyone familiar with publications of this nature will know what to expect from this volume. The opening chapters unsurprisingly deal with the design concept and development of the T-8, which was to emerge as the Su-25. One then gets a sub-type by sub-type description of the prototypes and production variants including illustrations to highlight the variations. The design description combines written analysis with many up close photographs, whilst a chapter on new generation Shturmoviks deals with the upgrades and improvements to the single and two seat Frogfoot models to incorporate the lessons of the Afghan war and keep the aircraft viable on the future battlefield in the same way as the Warthog is evolving in the current C model upgrade for the USAF. The usual "in detail" section provides modelers with a wealth of detail shots both internally and externally whilst the final chapters look at the Su-25 in action both home and abroad and the may operators of the type. As with other volumes in this series the modeler also benefits from line drawings and nicely rendered colour profiles of various Frogfoot sub-types to complete the volume. With many Su-25 Frogfoot kits on the market in various scales (some good, some not so good) this volume will serve any modeler with a desire to add the Frogfoot to their display cabinet well. Highly Recommended for fans of the Russian aviation types.